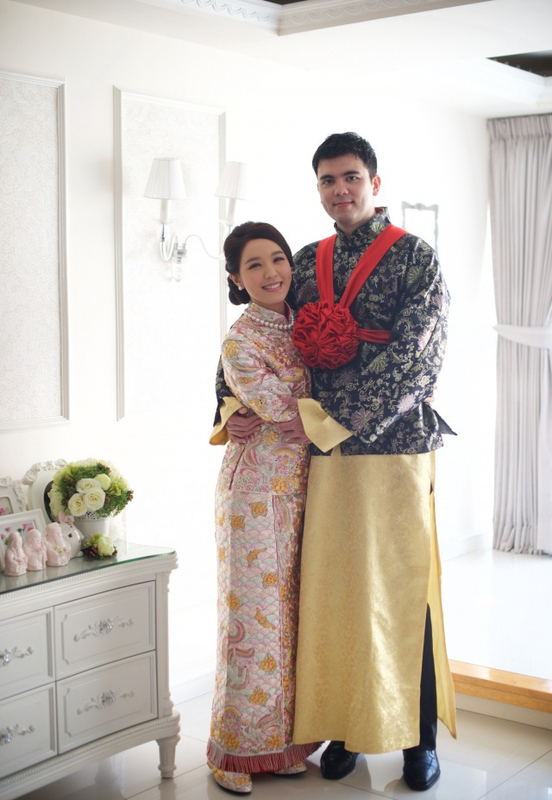 Ella Koon (官恩娜) and boyfriend of six years, Juan-Domingo Maurellet, got married in a low-profile wedding yesterday. 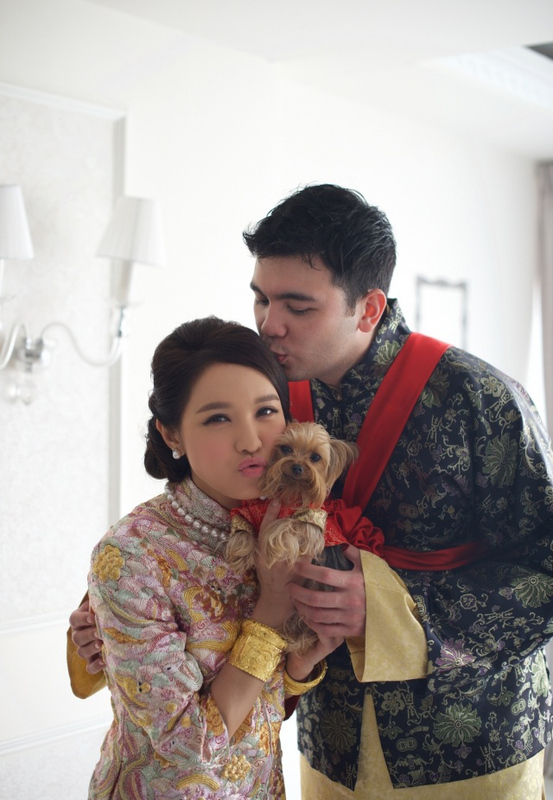 Observing traditional Chinese customs, the couple paid respects to their parents in a tea ceremony in the morning, followed by a small, upscale wedding banquet. 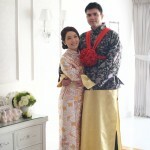 Ella wore a $1 million HKD wedding gown by a French designer. 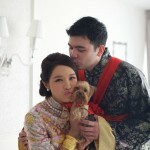 Ella’s father reportedly gave tens of millions as a wedding gift, while her uncle gave jewelry valued over $1 million HKD. While exchanging their wedding vows to love each other for the rest of their lives, the bride and groom both cried. Ella and Domingo thanked their parents for raising them, allowing them to grow up in ideal environments. The couple met through a speed dating event in February 2009. Domingo intrigued Ella with his mixed English, French, and Chinese heritage, as well as his medical background. Domingo works as an anesthesiologist at Queen Mary Hospital in Hong Kong and also has a practicing clinic in Tsim Sha Tsui. His father owned a luxury designer label prior to his retirement, while Domingo’s elder brother is a barrister. The Maurellets own a 10,000 square feet home in southern France, which delighted Ella in an earlier visit. Last November, Ella revealed that Domingo had proposed during their trip in Paris. Like all brides, Ella felt exhilarated and stressed while planning for her wedding. She is grateful for Domingo’s support and glad that the wedding proceeded as they envisioned. As their parents did not wish for publicity, Ella did not invite friends within the entertainment industry to her wedding banquet. Her music company, Warner Music, confirmed to the press that Ella’s wedding took place yesterday and the couple is already on their honeymoon in France, where Domingo was born and raised. Despite the haste in which her wedding took place, Ella’s representative denied that Ella is pregnant. “I know that many friends in the media are interested in the details of our wedding. However, to respect our parents’ wishes, we wanted to keep our wedding low profile and did not invite the press to attend. I hope everyone understands,” Ella said. After marriage, Ella hopes to continue her music career and make greater strides in the industry. Is it just me that I think both of them have gained some weight. Having said that, I think they looked great!! Congrats to them!! COngratz Ella happy for you!!! Congrats! Ella is glowing! Anybody got a full view of her dresses? Btw how old are they ? Just curious..
Juan-Domingo is his first/given name, so doesn’t denote anything. The name Ella is Greek or Norman in origin. I doubt Ella has any Greek or Norse in her. Similarly, the name Louis is old French in origin. I also doubt Louis Koo has any French ancestry in him. Congrats, Ella looks beautiful and happy. Perfect match in terms of physical appearance and chemistry! Congrats to Ella and her husband!!! Lol Ella is known as a beauty goddess in HK. Her fiance is nowhere near her in terms of looks. However, it feels like he treats her very well and will treasure her for years to come. That, is worth more than looks. I’m not saying that he will mistreat her or something. In fact, seeing them together gives me a good feeling and I can feel the love they have for each other. Besides, Ella’s husband is rather tall, manly and good looking and has stable career. Plus, he is much better than Ron Ng. I didn’t say that’s your original intent either. I just don’t agree that they’re perfect match in terms of looks. But I’m happy to concede that looks don’t matter in the bigger scheme of things, that’s all. Best wishes to this lovely couple. Hope she continue acting after married life. Wow, her hubby is tall. Ella is already a tall girl and her hubby looks so much taller than her. Congratulations! They are a pretty looking couple! Don’t know why the public media is so interested in the other half’s background in terms of wealth and profession. Ella Koon is married to Juan-Domingo Maurellet, not his wealth and profession. I also think Juan-Domingo has some Spanish heritage. His first name is Spanish. Always liked Ella – glad to see her happy. All the best to the new couple! Congrats, she looks so stunning! Now that Nori mentioned it, I took a second look at Ella’s Hubby and did feel like he’s just a mixed (as in heritage) version of Ron. That chubby face and dimples resemble Ron. This is a blissful union. True love never dies, it only gets stronger. Spread love everywhere you go. Your love for one another is contagious as evident in these wedding photos.